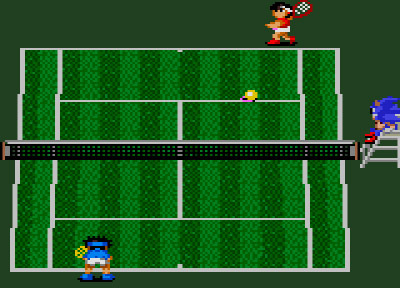 Take Smash Tennis for example; this is an obvious clone of Nintendo’s own Tennis. It even includes Sonic as an umpire instead of Mario which is about as subtle as a mallet to the skull. 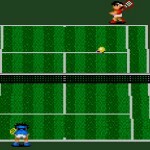 This simplistic take on the sport offers a single set game or a three set game and you’re given four levels of difficulty for your AI opponent. You can only play in singles but even so, this is a pretty decent package considering its only one game in a pack of four. It’s surprisingly good fun as well, with a fairly large hit box for you to work with and some satisfying hit detection when you connect racket to ball. AI is just on the right side of challenging, even on the lowest difficulty setting, and it makes for a great portable take on the sport. 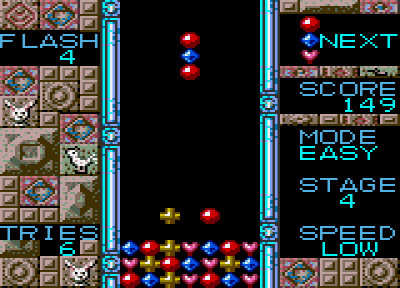 Next up we have Columns II which basically gives you the flash columns mode from the original Columns to mess around with, except with one major difference; you know have to connect four matching jewels together to clear them. Also, you can only clear the jewels if they are connected vertically and horizontally; there’s no diagonals in this variation. This actually adds a little more depth to the game and it begins to resemble SEGA’s other puzzle property, Puyo Puyo. 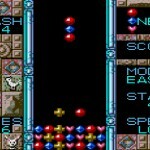 With the focus on clearing a set amount of flashing jewels that are arranged in more convoluted ways as you progress from stage to stage, this offers some pretty decent puzzle action to get your teeth into, and if it’s all a bit too easy then you can knock the difficulty up to normal and change the speed to ‘mid’ to really challenge yourself. 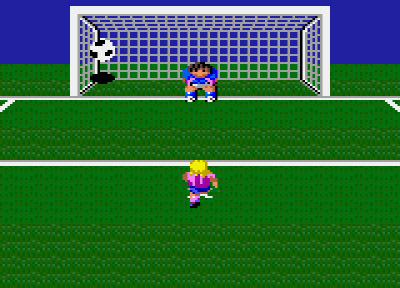 Third on our list is Penalty Kick-Out and it’s the only real stinker in this collection. This incredibly simplistic take on shooting penalties in football (or soccer if you’re not from the UK) basically gives you five attempts to score a goal and then it switches over to the opponent, meaning you play as the goalkeeper, blocking shots from an AI striker. It basically amounts to choosing how to take your shot or choosing which direction you want to dive in and that’s it. They’ve tried to add some depth by allowing you to take your shot from one of three positions or changing the height of your shot, but it feels a little futile as the actual gameplay itself is just a tad too dull to really enjoy. 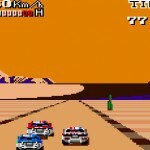 Finally we get to Rally Challenge which is an arcade-style, time attack driving game in the Hang-On mould. This little game sees you speeding across various stages in the best time possible so you can add more time to the clock for the next stage. Each stage gets progressively windier with more frequent turns of varying intensity. This means you’ll find yourself hitting the brake more as the game progresses. You’ve got a gearbox with a low and high setting that you’ll rarely worry about once you’ve kicked it into high, but generally there’s a lot to like about this title. 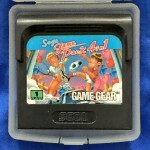 The action is fast and responsive and it basically delivers a solid time attack driving game on the go. Sadly, extended play begins to reveal how limited the soundtrack is. Here’s hoping you like that one tune because you’ll be hearing it for the entire time you’re playing and it’s only a short little loop. Rally Challenge is not the worst title in this collection, but it’s definitely one of the more limited titles on offer. 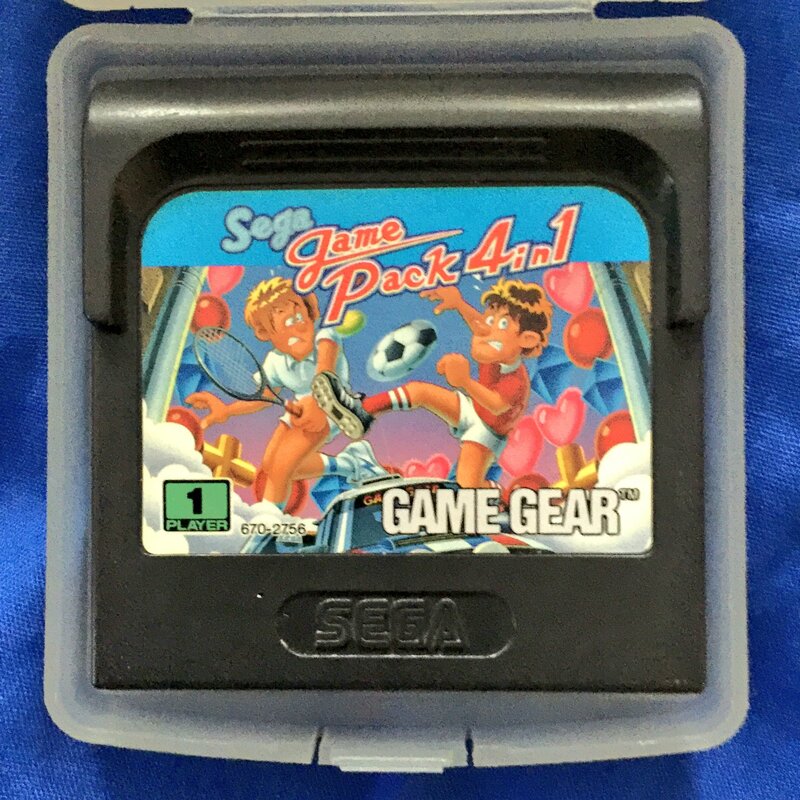 Outside of the dreary Penalty Kick-Out, SEGA Game Pack 4 in 1 is a robust little package that shows what the Game Gear is capable of, but also offers some solid bite-size fun on the go. Columns II and Smash Tennis are the real highlights and they offer a surprising amount of substance for a title like this. 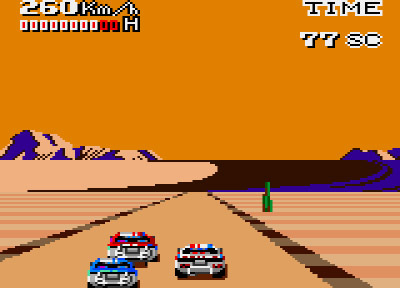 Rally Challenge is certainly worth a look as well, but depending on how you feel about the soundtrack, you’ll probably find it becomes tiresome a little faster than the others.